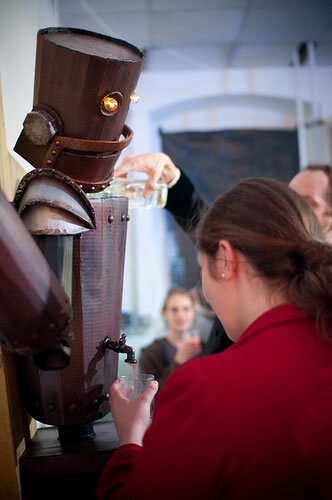 The Miraculous Stigmatabot is not your average robotic bartender. Created by David Fine, Aaron Muszalski, and Jonathan Moore, it will dispense fine table wine with the proper inducement. 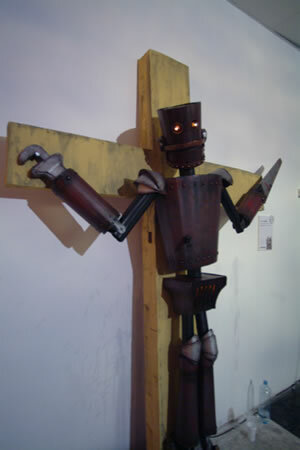 A forgotten relic of a fictional future, The Miraculous Stigmatabot was rebooted for your sins. A martyr to the abandoned ideal of the Anthropomorphic Automaton, the Stigmatabot now performs the miracle of transubstantiation, using what little energy flows through his fading circuitry to convert water into wine. Science fiction fans have of course thought about robotic bartenders since at least the 1943 introduction of the usuform robot bartender in Anthony Boucher's Q.U.R..
See more of Stigmatabot at Gigapan.